We’re excited to announce an eclectic lineup of Fall 2015 Classes & Workshops. We’re offering noncredit courses led by excellent writer-teachers in creating your own chapbook, literary translation, illness narratives, climate change and poetry, and intertextual poetics. Go to our website for full course descriptions and to register. Join one of our courses this fall and get writing! “Everyone who is born holds dual citizenship, in the kingdom of the well and the kingdom of the sick,” writes Susan Sontag. 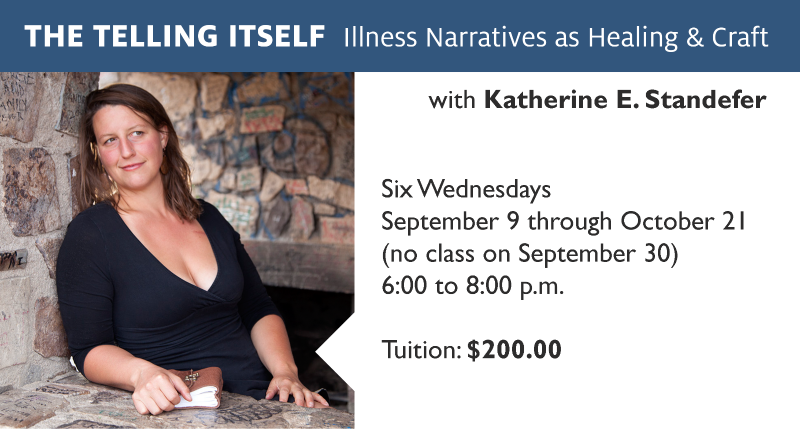 In this six-week course, writers will craft personal nonfiction narratives that explore the experience of illness. Together, we’ll consider how craft choices such as chronology, scope, perspective, structure, and a widening of the narrative lens can elevate the personal to the universal, as well as how to avoid common illness narrative pitfalls, including overly technical language and the onerous play-by-plays of treatment. In addition to in-class writing prompts and weekly writing exercises, writers will turn in one essay for workshop, receiving targeted feedback from their instructor and classmates. The chapbook, or “little book,” embraces smallness and largeness, brevity and expansion. It is humble but not diminutive, precise and beautiful. It is the physical combination of art and text. 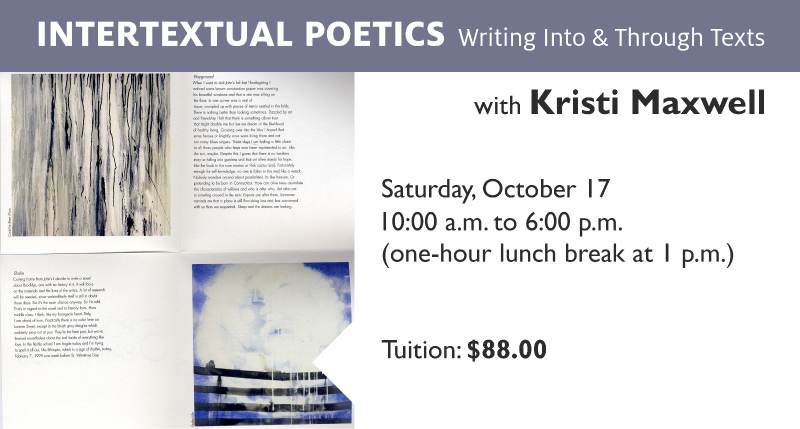 In this workshop, we will take a small group of your writings and/or visual art and create a “little book” of your making. To do this this, we will employ in-class writing exercises and some experimental techniques to generate new possibilities in content and form. 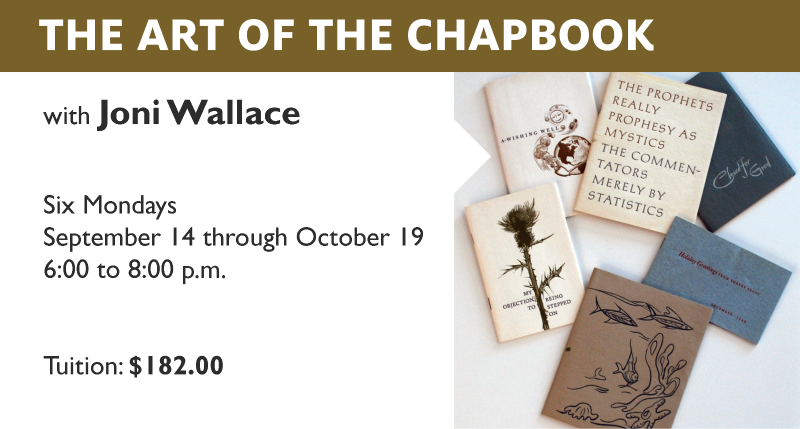 We’ll also look at the history of chapbooks, the presses who publish them, some simple bookmaking techniques, and explore some of the amazing chapbooks housed in the Poetry Center’s special collection. By the end of the course, every participant will have created and polished a 10- to 12-page chapbook of their own. In this workshop we will explore poetic translation as a kind of migration. As translators, we will move and move with the body of a text from one language into another. To move with the body of the text, we must not only read closely into language but also listen deeply to the voice of a different culture and time. 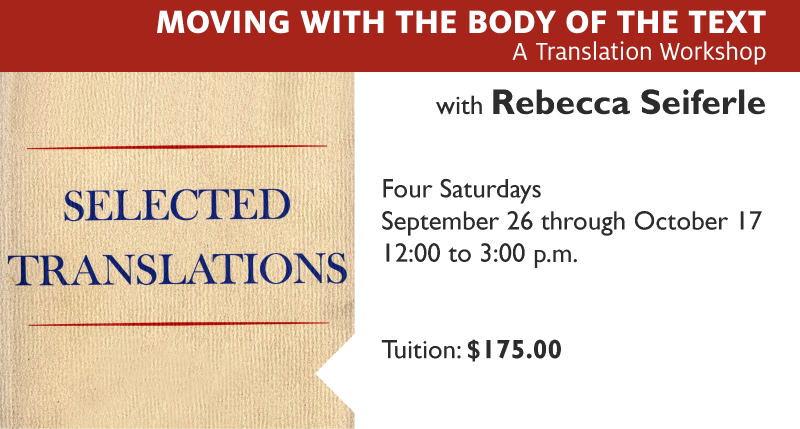 In this workshop, we will read multiple different translations of original texts by Wisława Szymborska, Sappho, Cesar Vallejo, and Federico García Lorca (among others) and consider different approaches to translation. We will also engage in the process of creating our own translations. By the end of the course, you will have completed a few of your own translations of short poems. Climate scientist Mike Hulme has written, “we need to reveal the creative, psychological, ethical and spiritual work that climate change is doing for us.” That is precisely what we’ll consider in this class. 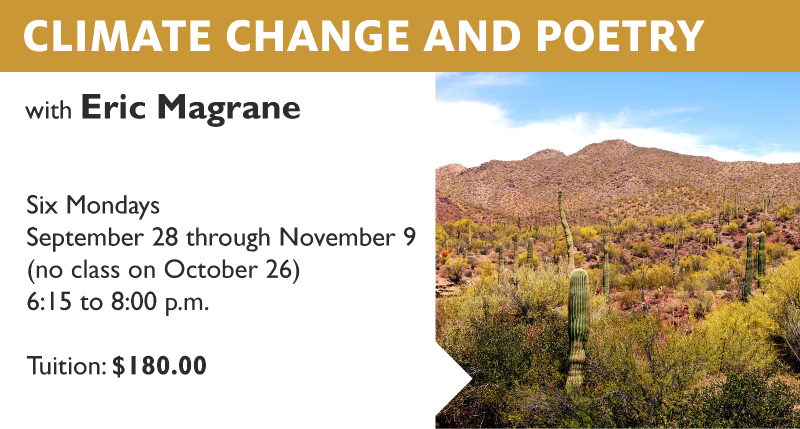 By blending readings of poetry with social and scientific readings of climate change, we’ll learn more about environmental poetry and about climate change, and we’ll think about how poetry and creativity may have a role in adapting to a warming world. We’ll read poetry that both directly and indirectly addresses climate change, including work by Patricia Smith, Brenda Hillman, Stephen Collis, Kathy Jetnil-Kijiner, and many others. We will primarily be reading and discussing poetry in conjunction with climate reports and texts, but we will also incorporate some writing exercises throughout, generating our own work. This one-day course will celebrate the interrelationship between writing and reading. Participants will be writing into and through various texts (some of your choosing, and others provided by the instructor). To supplement our writing activities, we will also read some poets whose work mirrors the intertextuality we’ll be exploring, including Dan Beachy-Quick, Kiki Petrosino, Don Mee Choi, Evie Shockley, and John Cage. This class is open to everyone, regardless of previous writing experience. Readers especially welcome! Please come prepared with a few books, poems, manuals, or other texts you’d like to experiment with.